Hino Motors will continue to meet the challenges of creating the next generation of vehicles with the aim of “reducing new vehicle CO₂ emissions while driving by 90%” . 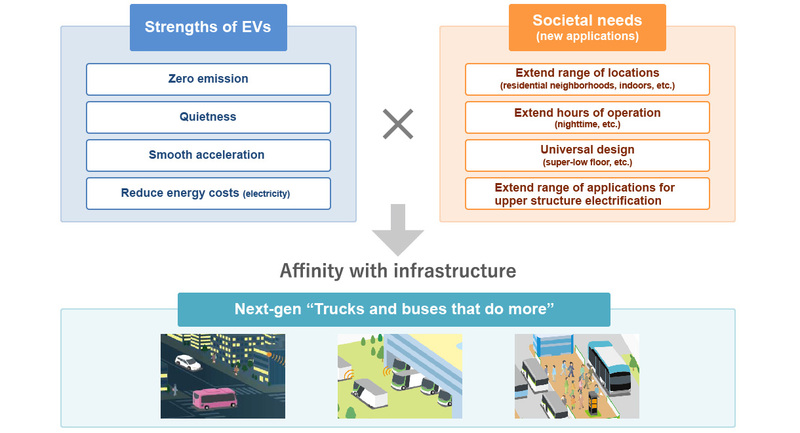 Utilizing the advantages of electric vehicles in response to various social needs, we develop "trucks and buses that do more," representing the next-generation standard. We will develop a "electrification platform" compatible with all power trains (devices that transmit power to the wheels) that can be fitted in any electric vehicles. *1 An inverter is a device required for operating a motor by changing its rotation speed. *2 The power-generating device of a fuel cell vehicle (FCV). *3 A range extender is a system consisting of an engine and a generator installed to extend continuous cruising distance. We have developed three types of electric vehicle for in-city applications—the small EV bus, the low-floor light-duty EV truck, and the fuel cell bus—providing vehicles that are easier and more convenient than ever before.